Every day we use and benefit from resources we all share—elements of “the commons” such as water, land, technology, public parks, and even culture. How society creates, uses, and manages the commons will be the theme of The Festival of the Commons, held October 7-8 at Augsburg College. 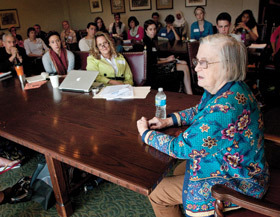 Elinor Ostrom, the first woman to receive the Nobel Prize in Economics, will be the keynote speaker. This professor of political science at Indiana University won the 2009 Nobel for research that demonstrates the worldwide importance of the commons.